It’s not hard to see the light when you look into the upgrades Morris has incorporated into their latest air drill. The new Quantum is designed to be the most durable and effective air drill on the market. Morris took no shortcuts when drawing out the plans for this machine- making it built to excel in less than ideal conditions. Another added bonus to this seeder is its flexibility. 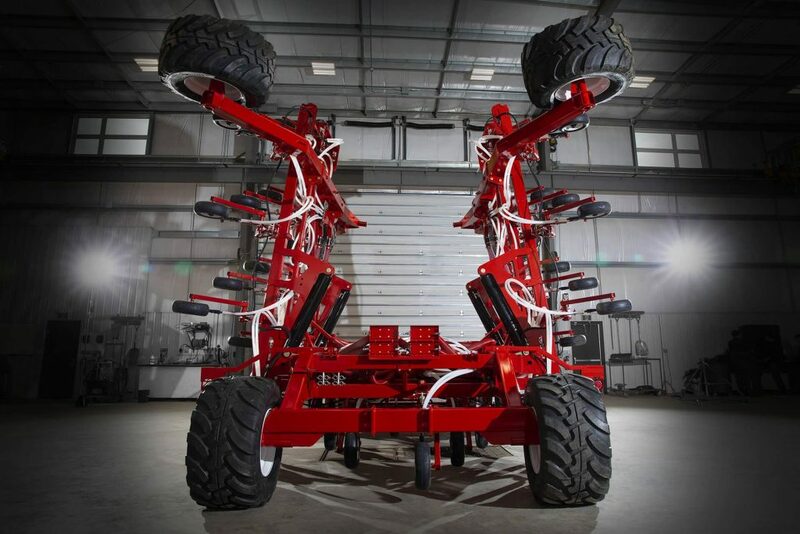 One drill can have a variety of re-configurable row unit spacing and width options- easily adjustable prior to trade-in or to adapt to the different needs of an operation. The Quantum’s frame is packed with chrome and steel making it 154% stronger than Morris’ previous drills. It has a 4×6 tubular steel frame, chrome pins which are 27% larger in diameter and a hitch fabricated with 20% more steel. The tires are larger in diameter allowing it to maneuver ruts and washouts in the field with ease. The main frame tires, on 3m centres, also make it ideal for reducing compaction in controlled traffic fields. The row unit and divider heads have undergone some intelligent upgrades also. An extended shank holder provides quick release off rocks and the ‘anti-skew’ packer arm deters the unit from catching on crop residue. Divider heads are made with stainless steel to prevent fertilizer and seed dust build-up. Hose upgrades have been incorporated to allow for larger seeds to easily pass through. Durability was not all Morris had in mind when designing this seeder- they optimized this machine to increase productivity. With the 70 ft Quantum at 15 inch shank spacing, and the ShieldCore paired row opener, at 6 mph you can plant the same amount of acres as you could with a 90 foot drill running at 4.5 mph. Flexibility is perhaps one of the most appealing aspects of this drill. Each drill can be re-configured to conform to a variety of row spacing options in both imperial and metric spacing. Ten, 12 and 15 inch spacing is available in 40, 50 and 70 foot working widths and 25, 30 and 38 centimetre spacing is available on 12, 15, 18 and 21 metre width drills. A good foundation is the key to everything- with Morris’ new technology, you can be sure you’re giving your crop the best possible start to grow to its full potential. There are many more innovations specific to the Morris Quantum. Want to know more? Check it out on Morris’ website or watch a video.